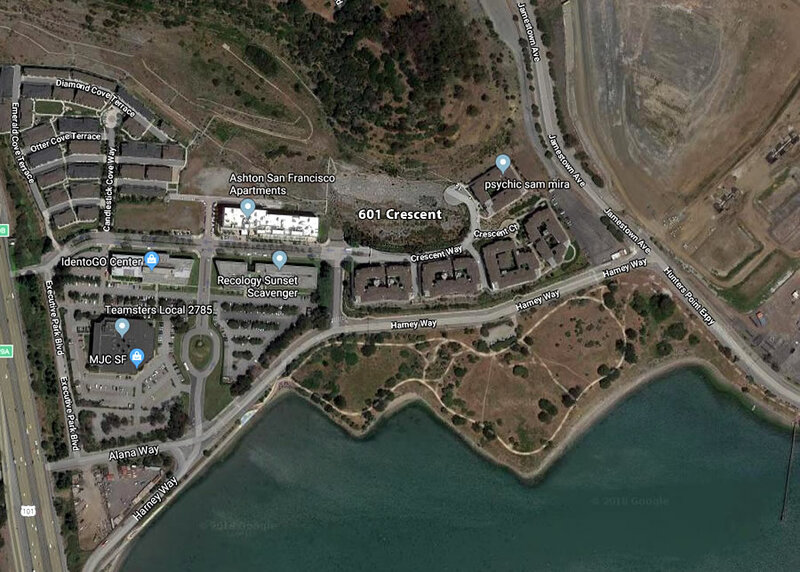 While the three-acre building site above The Cove at Candlestick Point was graded back in 2009, the approved development to rise up to 16 stories in height upon the undeveloped parcel has been on hold ever since. But next week, New Horizon Development is slated to reveal their revised designs for building 465 condos at 601 Crescent Way. 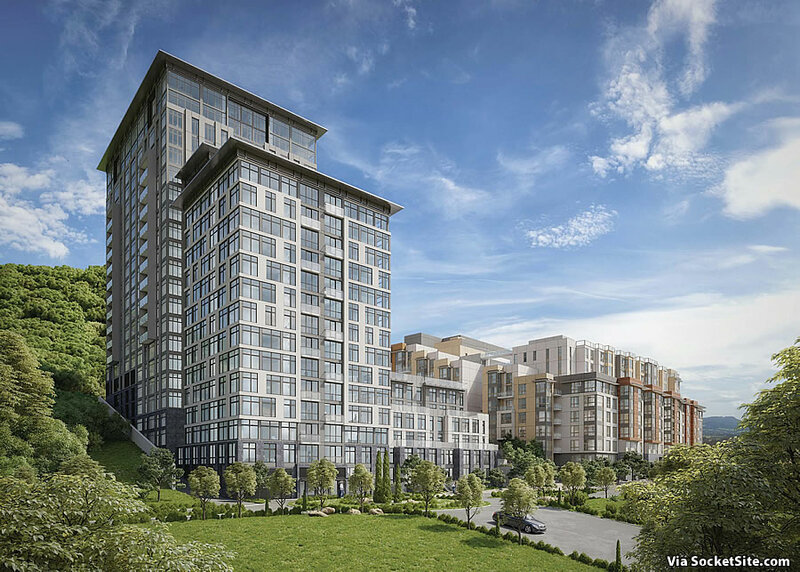 As newly rendered by BDE Architecture, the 465 units, a mix of 165 one-bedrooms, 191 twos and 109 threes, would be spread across two building masses, with a pedestrian passage between a 16-story tower and an 8-story midrise, and parking for a total of 582 cars and 264 bikes in a garage below. And with the refined plans in hand, New Horizon has now requested building permits for the entitled development. We’ll keep you posted and plugged-in. Strong No. This is not the kind of thing we should be approving. It’s in a transportation desert miles from anything. Every person installed into these residences will be utterly car-bound. It just doesn’t make any kind of sense. As reported above, the development has already been approved. We’ll add, the plans had included parking for 776 cars when originally entitled versus 582 today. And of course, there are plans for a new transit hub a few blocks away. I’m aware. It’s still nonsense. We shouldn’t be building around hypothetical, aspirational transportation facilities. We should be building on top of _existing_ transportation facilities in _existing_ walkable neighborhoods. We’ve been trying that. In the Mission. In SOMA. On Divisadero. Everything is drowning in a sea of lawsuits, “activism”, and entitlement/permitting hell. While I agree with you in principle, we need everything we can get. 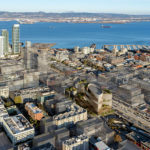 And if that means close to 500 units, including over 100 family friendly 3-bed units, moves forward with nary a bullhorn, grandstanding supervisor, or CEQA lawsuit in sight, then bring it on. i agree that this should be built and fast. while in principle, it would be great to upzone the whole mission and bernal heights to 10 floors everywhere because they are so transit rich, but unfortunately it will not get approved because of strong NIMBYs in the MISSION. it can get built here because there are no neighbors. Build this and then move bus lines to meet the needs. there is a biotech hub 2 miles from here in SOuth San Francisco with 25K+ workers. this would be an excellent place to lvie and would be bikable to those jobs. What JWS said. This makes a lot of sense in mid SOMA, but the neighborhood fights anything over lowrise. The new supervisor will be more of the same. Or you could build it on Geary. No chance. When we don’t let dense development happen, we end up with sprawl. I’d love to see this height next to the Glen Park and Balboa Park BART stations, to say nothing of West Portal and Forest Hill Muni, so… yes. But I’ll take this, too. The southeast of the city will fill in and become more walkable/bikeable as developments like this, Schlage Lock and Candlestick open up. I certainly understand your point, but as everyone else noted we’re *trying* to add this kind of housing all over the city and not getting anywhere fast enough. Rejecting this would push this development/# of units further out into the suburbs at this point. Adding this to the city of SF proper is still much better than nothing. This is less than half a mile from the long-existing Little Hollywood neighborhood, and an approx 12 minute walk to the Arleta light rail station. Calling it a “transportation desert miles from anything” is melodramatic and incorrect. I hardly consider 0.8 miles or 17 minutes walking to CalTrain a transportation desert. Right now it feels more like Brisbane than San Francisco. But we need every housing unit we can build. Also it will be close to the future candlestick development. It won’t be so bad once Candlestick is built out, as well as Schlage Lock. This is literally a 5-10 minute walk from the Caltrain station as it is, and there will be a BRT right out the front door on Harney once Candlestick is built out. Compared to a lot of places in the region, this will someday be much more walkable and transit accessible. Sorry to see the more colorful design from the previous iteration give way to a sea of gray. But if they’re really going to build this much housing in the current cost climate somehow, then go for it. These guys really know how to time the cycle. Fully permitted and for sale in 2 mos? Seventeen minutes walking is just enough to start sweating, but not long enough to reap the benefits of aerobic exercise, so those who think that the ultimate buyers of these condos are going to do that on a regular basis are kidding themselves. And I say that as an avid urban walker. 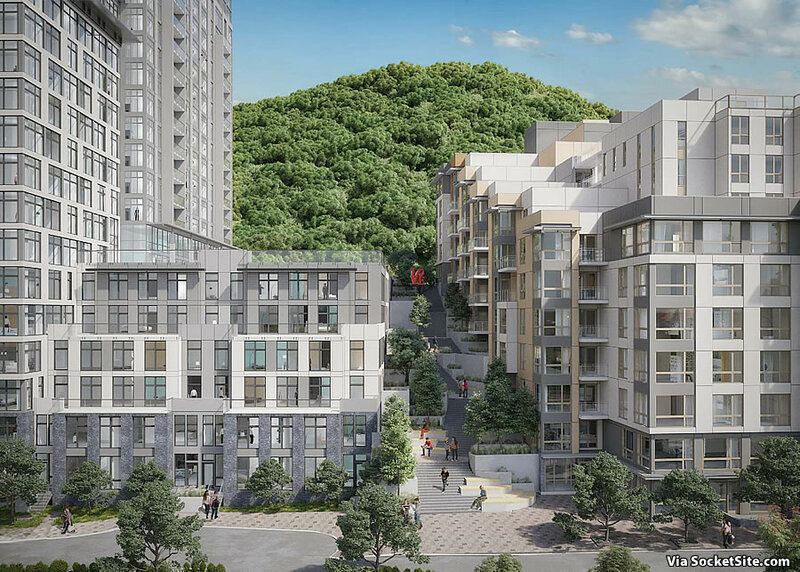 The yuppies who buy these units are going to be driving around in their Range Rovers and other makes of Luxury SUVs and the developer knows it, hence the originally-proposed 776 car parking. Tell me what the average selling price of the condos are, and I’ll tell you if the 264 bike spots in the garage will go largely unused. Add a loop, make it 30 min, problem solved. Drive into SF? No thanks. I’m saying this as an avid urban yuppy. If I’m buying here, I’m sure I’ll ride my bike to Caltrain to SF. That will be a million times better than fighting the traffic. Thousands of Londoners walk twenty minutes to rail every morning. Have you compared the average Londoner or Parisian to the average American? Myself, I would be worried about Agenda 21! NOT ENOUGH PARKING! What will I do without my Navigator? I hope the plans for parking 572 cars doesn’t change. i live in the homes at candlestick cove (the townhomes right behind this future development) and when I bought this home, they promised EACH home would have 1 parking slot. That is completely false now that the development is completely filled and built. Every home has a permit but there definitely is not enough parking slots for EACH home in the development! We pay so much for living here, HOA fees are high and we have no amenities (no gym or hall), and we can’t even have guests visit. And ask people in the area how many cars have been broken into outside the development on executive park blvd??? Ask the Bayshore Police Station too. Hopefully those crimes don’t happen once these communities come up. Because the city has not done anything to even help with the car break ins. We can’t even get a security guard in our development, they won’t even install bright lights or anything on the adjacent streets to deter criminals (Go check out how dark the streets are right now). Sounds like you need a revolution at the HOA Board level. That place has the potential to be really douchey. Pluto’s salads, an REI, fixed gear bicycles, artisanal teas. Seriously tho, they need widen the freeway and exits around there. Also, since they’re not blocking views, they should build up higher tho. Is there a demand for 3 bedrooms? With the shortage of housing in the bay area I would think dropping the 3 bedrooms for 1 or 2 would give more housing which is sorely needed.